Recipe Summary: Recipe for pesto, sun-dried tomato and caramelized onion pizza – a delicious vegetarian weeknight pizza that is simple to make and packed with flavor. Peel your yellow onion and slice it in half. Use a mandolin to slice the onion extra thin for caramelization. Pour 2 teaspoons of olive oil into a wide, shallow skillet or saute pan and heat to medium heat until the oil is shimmering. Add the sliced onions to the pan and stir to coat with oil. Spread them evenly into a thin layer. Sprinkle a pinch of salt over the onions. Let the onions start to brown and stir occasionally. Cook for 30 minutes to an hour – low and slow – for the best results. This is a great time to slice up your sun-dried tomatoes into small pieces and mince your garlic. Put some flour (and some cornmeal if you want!) on a table and roll out your pizza dough to your desired crust thickness. With a fork, poke some small holes at random places throughout the crust – this minimizes bubbles. Spread your desired amount of basil pesto sauce on the crust. Add your caramelized onions, minced garlic and sundried tomatoes. Top with mozzarrella cheese. Bake at 400 degrees for 12 to 20 minutes. This variance is so wide because baking time will depend on the thickness of your crust, shape of your pizza and amount of toppings. We always start at 12 minutes, and add time in 2-minute increments until the crust is golden brown and the cheese starts to brown. We are often Whole Foods shoppers, so we use their frozen whole wheat pizza dough ball. It’s a great pizza crust! 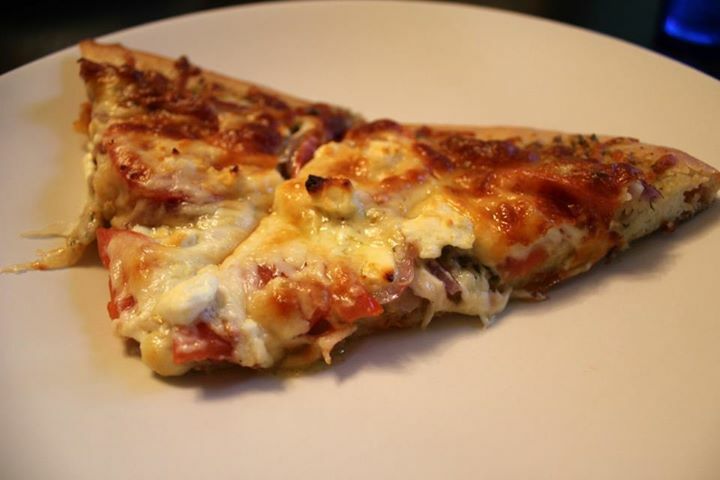 What’s great about this pizza recipe is that you can add or change almost anything to suit your tastes or whatever you have on-hand in the pantry. Making a great pizza is an imperfect art. Heat 2 tablespoons of olive oil in a medium saucepan over medium-high heat. Add the couscous and cook, stirring occasionally until it starts to brown, for about 3 to 5 minutes. Add the 4 cups of vegetable stock and bring to a boil, then lower heat to a simmer. Simmer for 10 to 12 minutes uncovered, or until the liquid has evaporated. Transfer to a large bowl to cool completely. Preheat your oven to 350 degrees. Arrange almond slivers in a single layer on a baking sheet. Bake for 8 to 10 minutes, occasionally shaking up the pan to get even heating. Site aside to cool completely. Mix together the vinaigrette with 1/4 cup apple cider vinegar, 3 tablespoons maple syrup (or substitute honey), 1/2 teaspoon coarse salt, 1/2 teaspoon fresh ground black pepper and 1/4 cup of olive oil. 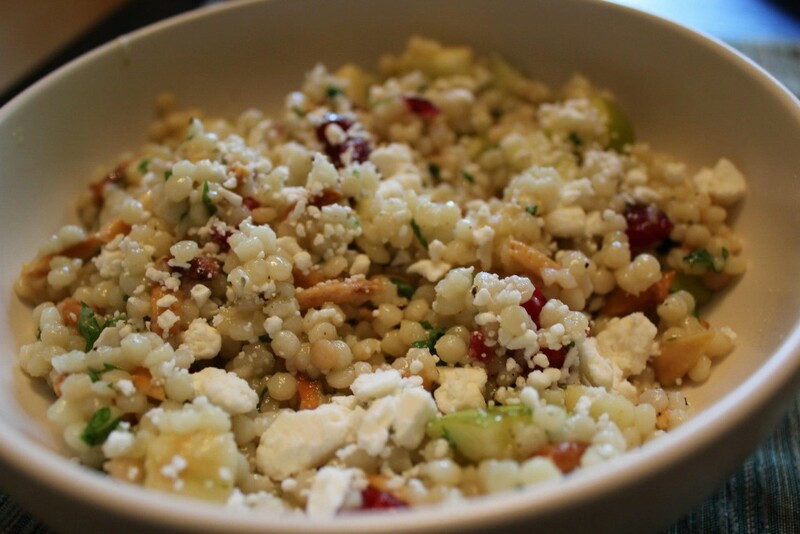 Toss the cooled couscous, chopped herbs, toasted almonds, apples and dried cranberries together. Add the vinaigrette and mix in completely. Serve topped with feta cheese (or leave it off if you’re vegan). Recipe modified from Giada De Laurentiis on Food Network. Original recipe here.